Reason number 4,326,897 why I love my husband: When he discovered a fleet of fuzzy caterpillars stoically trudging their way across a soccer pitch made of synthetic turf--an expanse that was as vast as the Serengeti to the poor things--he took time out of his lunch hour to transport each one to a better location in a hedgerow. One luckless larva appeared to be dead, so he brought it home so that we could identify it. He told me this after we were all tucked in for the night. "It's on top of the piano," he said. The next morning, it was still there, but when I picked it up, it wiggled. The rumors of its death had been greatly exaggerated. Still, it didn't have a lot of get-up-and-go. Probably because (a) it feigns death in self-defense, which is probably how it ended up in this predicament in the first place; (b) it was sluggish as it was getting ready to overwinter; and (c) first the artificial soccer pitch and now a piano--it had blundered into a very confusing habitat indeed. Woolly bears are famous not only because they're cute and colorful, but also because there is a long-held belief in their ability to predict the severity of winter. According to folklore, winter will be extremely harsh if the woolly bear's rust-colored stripe is narrow, mild if the stripe is wide. 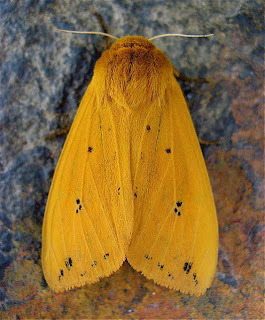 In actuality, individual woolly bears are variably marked, with the central stripe becoming wider as the caterpillar grows. The little bear perked up considerably when we put it in a bowl with a lettuce leaf covered with round raindrops. (Woolly bears eat a wide variety of leaves, unlike many larvae, which are dedicated to specific host plants.) First it put its tiny face to a drop of water, and we watched as the droplet slowly vanished as it sipped. Then it investigated the leaf, though it didn't seem inclined to eat. A quick look in a field guide revealed that someday this caterpillar would grow up to be an Isabella Tiger Moth. First, it would have to spend winter curled up in a bristly ball beneath some leaves. Its body would naturally protect it from the cold by producing a kind of antifreeze. 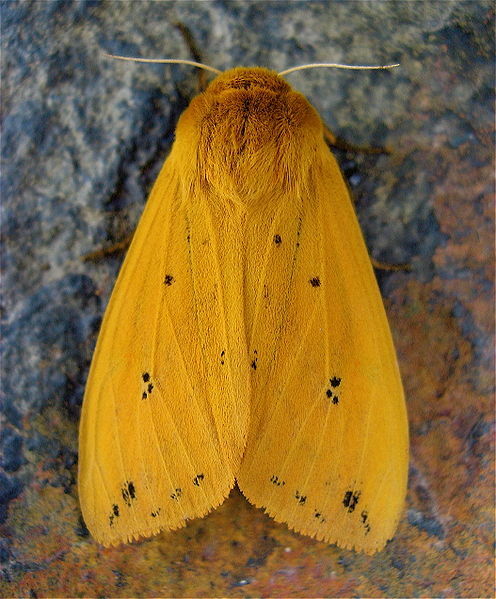 In spring, it would spin a cocoon, pupate, and eventually crawl out as an apricot-colored tiger moth. We decided we ought to put it back outside, figuring that it probably needed cold temperatures to develop properly, like seeds that need cold temperatures before they can sprout. According to naturalist Anna Botsford Comstock, we guessed right: In her 1939 work Handbook of Nature Study, she writes of the woolly bear that if you want to watch the larva's development, it's best to keep it in a box outside because "keeping it in a warm room during the winter often proves fatal." I am exceedingly jealous of the populations of Vermilion, Ohio; Banner Elk, North Carolina; Beattyville, Kentucky; and Lewisburg, Pennsylvania, because I have now learned that they have annual woolly-bear festivals. People dress up as woolly bears and even dress up their pets.